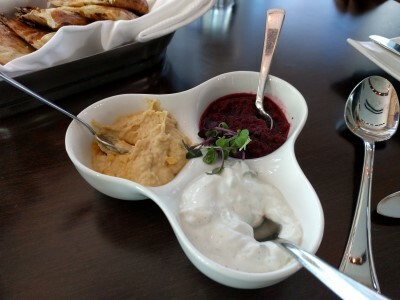 Hummus, a raspberry compote, a tzatziki. The bread was delicious. Soft, fluffy, chewy. 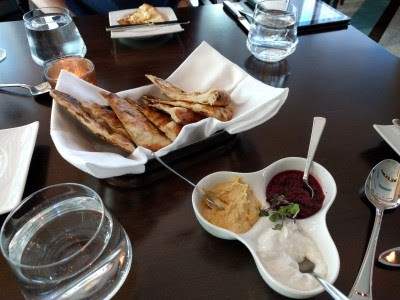 I like the raspberry compote a lot, but I liked the tzatziki more, and I ignored the hummus (garlic). 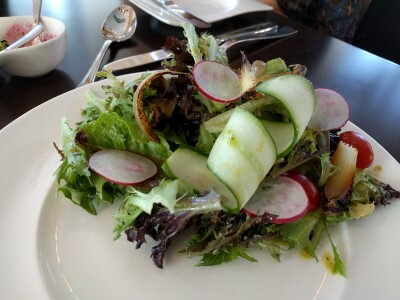 I started off with Local Organic Lettuces (chopped herb vinaigrette, radishes, onions). SP helped me finish it. Everything was crisp and fresh and yummy. For my meal, I ordered a starter: Burrata Risotto (roasted shrimp, tomato ragout). 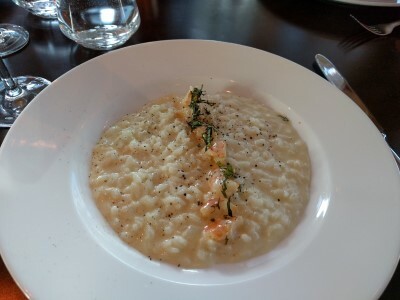 The risotto was creamy and cheesy and very good. I ate it all and I was stuffed. This was a great size for me. 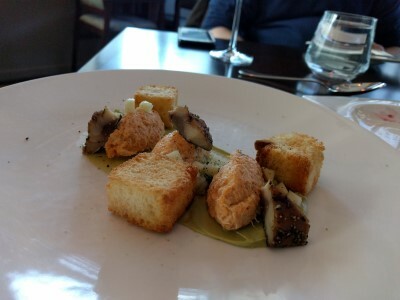 SP started with Crab Salad (smoked mackerel, avocado, cider vinaigrette, toasted bread). The crab salad was so smooth and creamy and crabby. Very good. 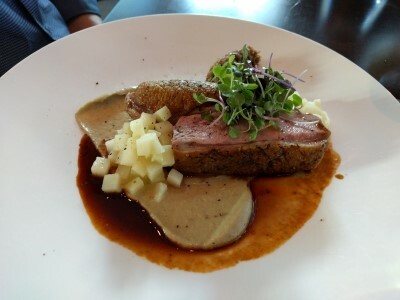 For his entree he ordered Seared Duck Breast (thigh confit, creamy artichoke, apple, port reduction). I didn't get the chance to try any since he quickly cleaned his plate, I suspect it was quite tasty. 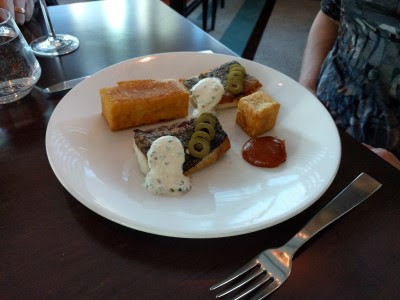 I took a photo of R's meal: Striped Bass (chickpea panisse, Castelvetrano olives, tomato marmalade, chive cream). She said it was delicious. I kinda wanted to swipe an olive, some cream, and maybe a bite of the fried chickpea cake (I didn't). I didn't take a photo of S's meal or of the octopus starter they shared. 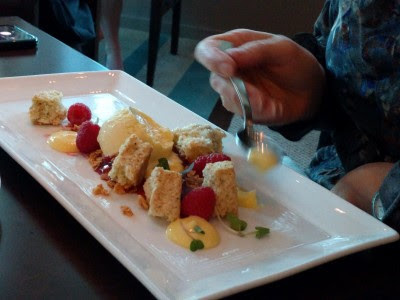 For dessert, R chose Essence of Spring (raspberry and rhubarb jam, roasted fennel buttermilk ice cream, black pepper short cake, white chocolate citrus crunch, lemon curd, sugar-tossed raspberries). She said it was tasty and light, definitely spring-like. S and I each ordered Chocolate & Tea (gluten-free chocolate cake, milk chocolate cremeux, gluten-free broken tea cookies, Earl Grey tea ice cream, kumquat marmalade, orange meringue sticks). 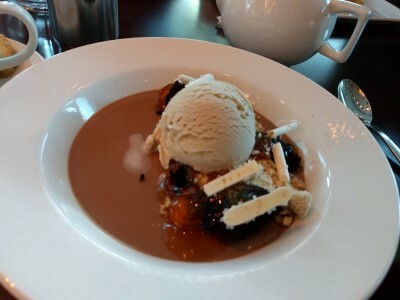 Honestly, owing to 2-3 glasses of wine, I don't recall much other than I was tipsy, full, and couldn't finish it but the earl grey ice cream was very nice. The cake and other bits must've been good because I ate those, I just left behind some ice cream and cremeux. 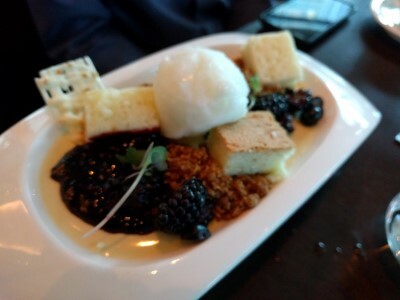 SP chose Berries & Blossoms (black and blueberry jam, chamomile custard, lemon froyo, sour cream cake, pine nut streusel). This is his kind of dessert. This was my second choice, but I couldn't resist the earl grey ice cream. We all enjoyed our food very much. Service was wonderful. A nice relaxing meal - maybe too relaxing because S&R had to rush a bit to get to their 8 pm show! I guess we were talking too much. 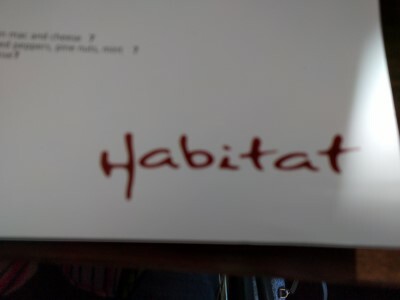 We definitely like Habitat and would return for dinner before/after a show or for a special occasion (it's one of those "more expensive" meals).